Following on from the previous post it would probably be useful to look at Ukraine in more detail, given what is taking place there, and what we might expect there in the near future. There are also the issues of Western meddling in that country, bad government within Ukraine, the neo-liberalization of Ukraine under Western direction, neo-Nazism, religious schisms and the fractious and fraught relations it has with its neighbors and internally. Ukraine is not a happy place, not where you might want to take your significant other for a vacation at the moment. Ukraine took a step toward despotism on the 26th when the Raga (parliament) authorized martial law in 10 regions in the southeast of the country. That is the region that borders the Black Sea, the Sea of Azov, the Donbass and Crimea – all the hot spots in Ukraine. Those regions are also strongly pro-Russian. Ukraine has a Virgo Sun with a stellium in Leo, including Mercury, Venus, Jupiter and Chiron. The latter demonstrates as the loud complaints against any perceived slight against the nation. The Aquarius moon is not a warm placement and it is opposite the stellium and square to Pluto. Pluto is in Scorpio, the sign it rules and is conjunct the Midheaven. In all, even though the Sun is in a wide conjunction with Jupiter, it can be a cold and bristly setup, which can also lean toward being very calculating and not very caring of who gets hurt in the process. That brings us to the angles, where it gets even more revealing. The Capricorn Ascendant is the midpoint between Neptune and the north node, which makes for uneasy relations with the outside world and an inhibited outlook. It can also point to deceit from others and misfortunes. Since the Ascendant represents the common people and the general mood of the populace, we see that Ukraine has been ill-at-ease with its surroundings since the very start. Capricorn rising also points toward ambitions, though. But with the midpoint structure it points more toward thwarted or disappointed ambitions, as well as outside forces interfering and selling snake oil to the populace. If this sounds bad enough, hang on, because we are just getting started. And, all this will be backed up in due course. Moving to the Midheaven, we find a Mars/Neptune midpoint there, with Mars and Neptune in tredecile aspect, which is of the quintile series of aspects. That midpoint indicates weak leadership and instability. More than that, it points toward a reliance on subconscious patterns and general discontent, This is what we have seen with the Ukrainian leadership, especially since the Maidan coup of 2014. They have played on old cultural sentiments to keep themselves in power and advance their agendas. Quintiles often carry a note of obsessiveness, but also of hidden creative potential. 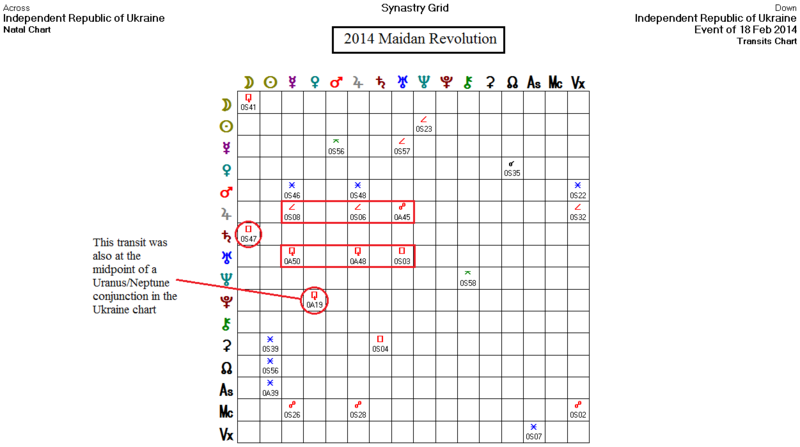 The MC also makes a midpoint with Mars and the Ascendant as well as with Mars and the nodes. So, there is a strong Martian tinge to the MC, with the latter two midpoints indicating comrades in arms, shared work but also conflict. And that brings us to probably the most revealing midpoints, involving Pluto – itself conjunct the Midheaven. The strongest midpoint Pluto forms is with Mars and Uranus, which speaks of force loud and clear, as well as violent interventions. This midpoint forms a septile triangle, with the septile influence giving a doorway into other realities. It could be a highly spiritual configuration, but currently it is expressing quite violently. There is also a Sun/Saturn midpoint, with the Sun and Saturn quincunx each other, which points toward developmental problems due to illness. The illness to which Ukraine is prone is toward Nazism and separatism. We’ll have more on that in a bit. The Sun/Saturn quincunx gives a tendency toward depressing influences anyway, with Pluto also representing underground resources – gas, anyone? Or coal? It also reinforces the previous reference to reliance on subconscious influences. Ukraine has trouble with both gas and oil. The coal regions are in the southeast of the country, the region currently under martial law. The latter has not gone down well with the populace of the region. 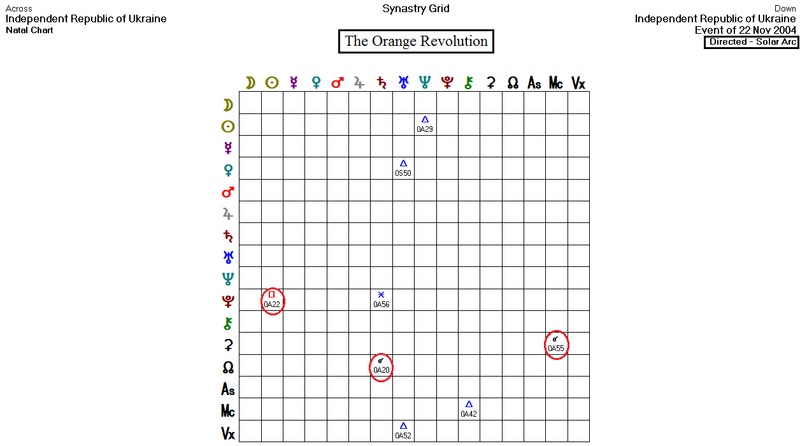 The Orange Revolution: (chart) Directed Pluto, and thus its midpoint trees, were square Ukraine’s Sun (leaders in general), which co-rules the 7th house, indicating the constitutional crisis at the time. The Orange Revolution was due to controversy over the vote count from the elections, with the result that the vote was overturned and new elections were held. 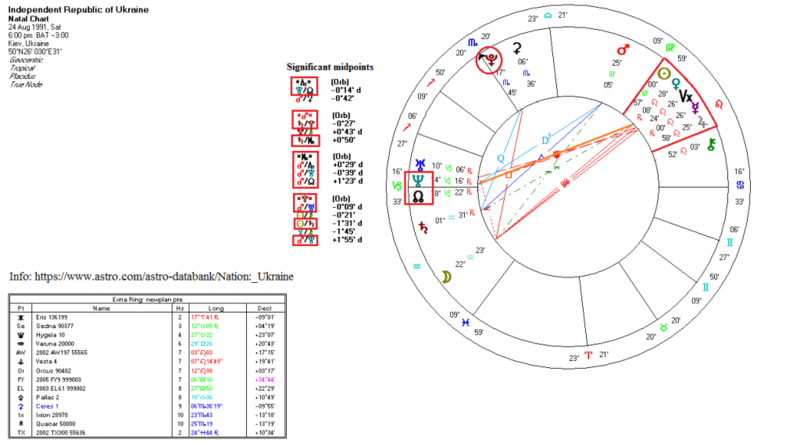 The directed north node was conjunct the Ukraine Saturn, the latter ruling the 1st house (common people), showing the general dissatisfaction with the election result. Directed Ceres had just come within orb of Ukraine’s MC, indicating a turning point in Ukraine’s leadership. The Maidan Coup (chart and this): For the directions, which are virtually the same, see the next entry. For transits, Pluto was transiting sesquisquare to Venus, showing the subversive influences extant at the time of the coup (Pluto/9th house), the damage to infrastructure, and the mobilization of opposition forces (4th house) to the sitting government. Pluto was also transiting the midpoint of the Uranus/Neptune natal conjunction in Ukraine’s chart, which itself is a revolutionary transit, but at the same time showing a populace very easily manipulated, open to outside influences as well as great losses and catastrophes. 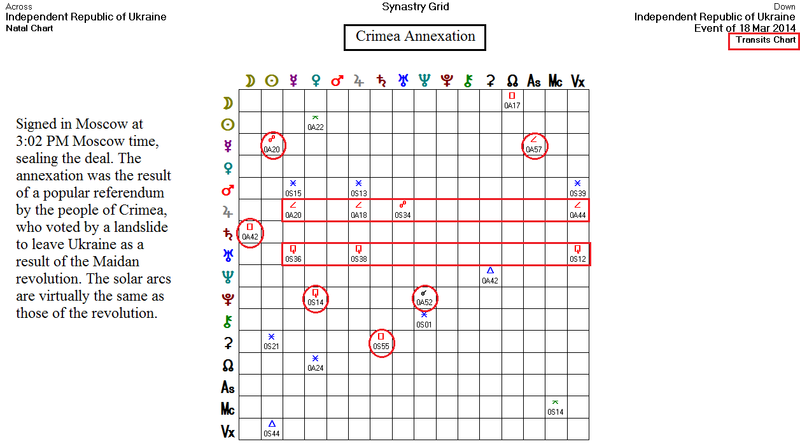 Transiting Saturn was square the Ukraine Moon, the latter ruling both the common people and the 7th house of legal matters, partnerships and open conflict. And then, transiting Uranus was also making its square to its own place, which is commonly associated with ‘midlife crises’. The Secession of Crimea: (chart) To Ukraine, this was annexation by a foreign power. To Russians and Crimeans, it was secession. To the West it was a blatant case of ‘Russian aggression’. The truth is somewhere in between. Pluto (endings and losses) by direction made solar arcs to both Venus and Neptune. Venus represents the loss of territory (4th house) and influence of a foreign power (9th house, Russia in this case). Neptune (2nd house ruler) points to the loss of income represented by the loss of payments from the Russian naval base at Sevastopol, the loss of Crimea itself as a state revenue source (which was not that great as it turns out) and Ukraine’s loss of esteem in the international community. There was also a solar arc of Saturn to the Moon, representing a loss (Saturn) to the people (Moon), and loss of partnership/legal loss or legal matter (Moon ruling the 7th house). 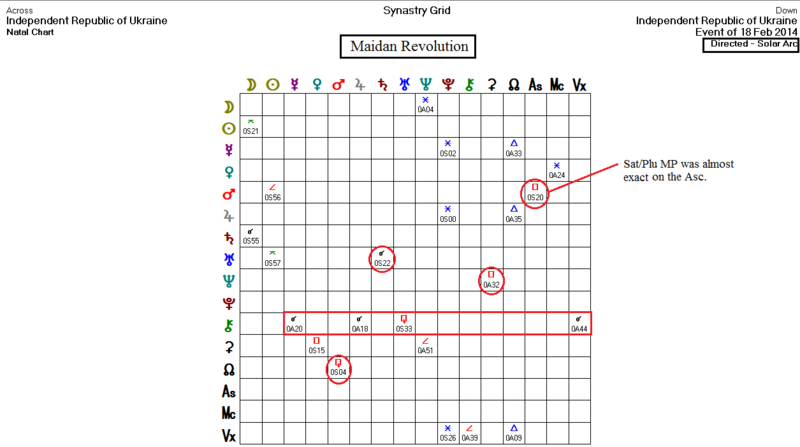 It is worth noting, too, that Venus is at the midpoint of the Mars/Saturn axis, the latter pointing to the ‘martyred 100’ who died during the Maidan riots. 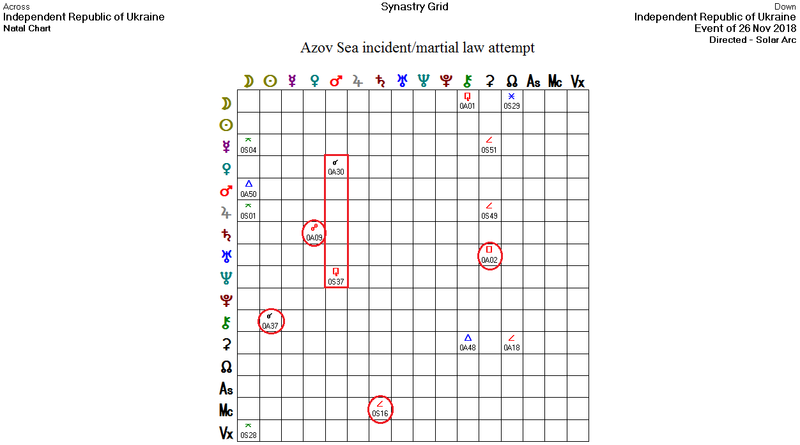 The Sea of Azov incident (chart) and subsequent martial law declaration: Directed Saturn is opposite the Ukraine Venus, showing the heavy hand of the government. Saturn is also the midpoint of the Moon and Uranus, that midpoint now being directed to Venus, showing sudden setbacks and a striving for independence along with separations. And that takes us to our present state of affairs in Ukraine. 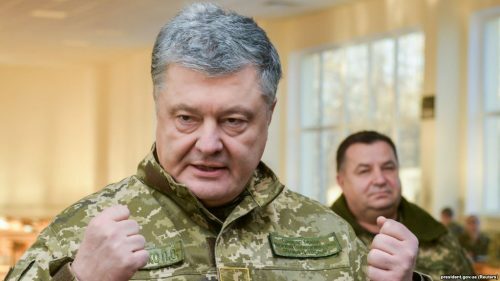 Petro Poroshenko, in his attempt to impose martial law across the whole of Ukraine, had sought to assume dictatorial powers, to become an autocrat. It was a strong step toward dictatorship in Ukraine. It was also an attempt to silence his rivals and put off elections. It was fomented by what we would otherwise call a ‘false flag’ event, with the Sea of Azov incident, blamed on Russia by Ukraine and the West. He failed, but that does not mean that the future of Ukraine is secure. Far from it. There are other provocations that can be staged, other measures to be undertaken. At this juncture there is still much that can happen. If this chart continues to prove itself, Saturn will transit over the natal Uranus/Neptune midpoint in the early days of next year, mentioned before, which can represent a painful loss. Directed Saturn will be almost exact on Ukraine’s Venus, which also points to difficult times. Western interference in its affairs. Russia and Ukraine had strong economic ties in the past and otherwise on-again-off-again relations since Ukraine’s independence. Ukrainian oligarchs, of which Poroshenko is one, who have absconded with Ukraine’s previous wealth and infrastructure. Political corruption is endemic in Ukraine as a result. Its social and cultural troubles of long standing. Can these things be turned around? Of course, but it would take strong leadership, which is not forthcoming and probably would take a long time. Dictatorship is not strong leadership, nor are the NATO members behind the recent event on the Sea of Azov likely to be that patient, given the pace of evolving geopolitical shifts. 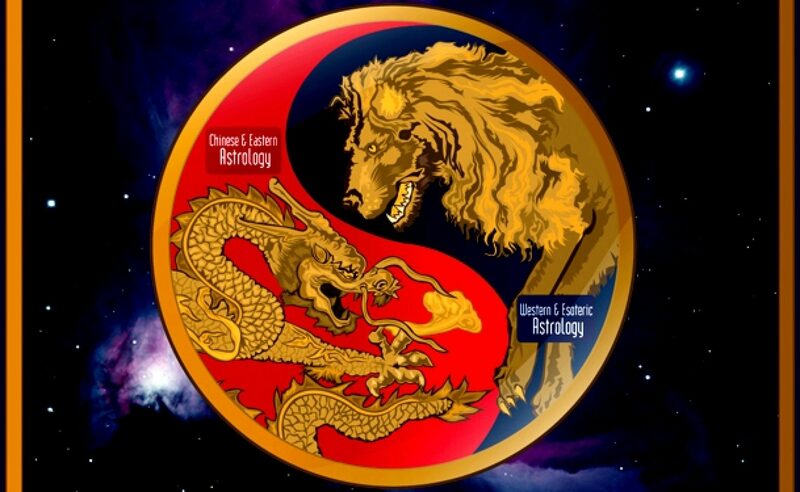 Some of the midpoints listed, along with the Capricorn ascendant point toward a hard-working, determined populace when rightly applied, capable of great achievements. This is especially true of the Mars and Pluto midpoint trees. In all, there could be a bright future for Ukraine, but foreign powers would have to stay out of their business. Given current antagonisms between the West and Russia, that is not likely to happen. If a dictatorship does come about, that will set Russia even more on edge. It would also not go down well with the EU. Common sense would say that the Russians are not about to allow too much untoward to happen to the ethnic Russians in Ukraine, nor to allow another NATO state on their border. If worse comes to worse, Ukraine could easily split, or be split. No one really wants that. Great care is needed there, especially in the months immediately ahead.